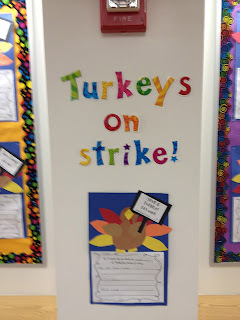 Of course turkeys would be on strike this time of year! 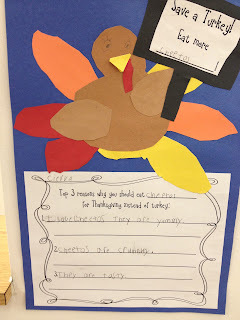 My little ones made these adorable turkeys who are trying to convince people to "Save a Turkey! Eat more ________!" The ones pictured chose beef jerky, Cheetos, and chocolate chip cookies. 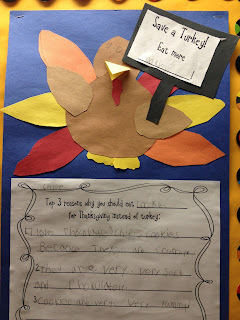 They had to come up with the "Top 3 Reasons why you should eat ______ for Thanksgiving instead of turkey". We had brainstormed describing words before completing this activity and we focused on writing complete sentences. The kids and I had a great time with these. If you'd like to grab the signs and writing paper, click HERE! I am still working on getting the patterns on the computer, but I don't think that will happen before Thanksgiving this year :( There's always next year! Super Cute activity! I've pinned it for next year! Hi I recently started following you and I recently was nominated for the lobster award and now I am awarding you! Check out my blog for details! Really cute piece! Thanks for sharing it! I love this. Thank you! Do you know a book that can go along with this? 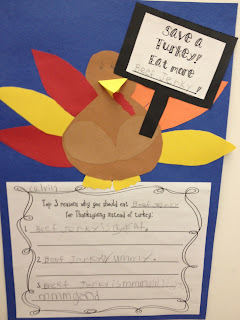 Do you have the turkey pattern by chance? Thanks for sharing this is really cute! I am focusing on complete sentences and this works really well.